In the Transcription and Gene Expression unit we will extend our knowledge on Topic 2.7 DNA Replication, Transcription and Translation. We will also look at how the environment can influence gene expression. Information stored as a code in DNA is copied onto mRNA. State two reasons why gene expression must be regulated. Outline the environmental regulation of the breakdown of lactose in E. coli. Outline the role of enhancers, silencers and promoter-proximal elements in regulation of gene expression. Describe the use of twin studies to measure the impact of environment on gene expression. Outline two examples of environmental influence on gene expression. When acetyl groups are added to the positively charged histone tails, they become negative and the DNA repels against them. This opens up the nucleosome so the DNA is not as close to the histone anymore and chromatin remodeling can occur. 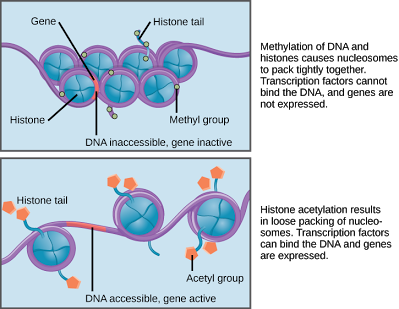 This acetylation of the positive histone tails and opening up of the DNA structure allows the gene to be transcribed more often. Outline the effect of methylation of nucleosome tails on rates of gene expression. Outline the effect of acetylation of nucleosome tails on rates of gene expression. 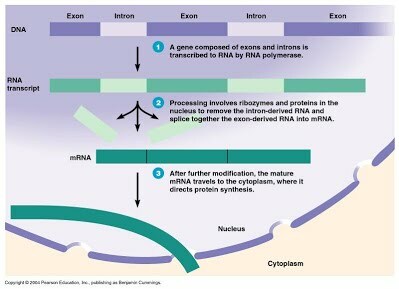 As eukaryotic mRNA travels from the nucleus to the ribosomes, non-coding strands of the mRNA called introns are removed to form functional mature mRNA. 7.2.U 4 Splicing of mRNA increases the number of different proteins an organism can produce. (Oxford Biology Course Companion page 358). Describe the initiation of transcription, including the role of the promoter, transcription factors, the TATA box and RNA polymerase. Describe elongation of transcription, including the role of nucleotide triphosphates and the direction of transcription. Describe termination of transcription, including the role of the terminator. 7.2.U5 Gene expression is regulated by proteins that bind to specific base sequences in a DNA (Oxford Biology Course Companion page 351). List two major differences in gene expression between prokaryotic cells and eukaryotic cells. Describe the three post-transcriptional modifications of pre-mRNA in eukaryotes. In prokaryotic cells such as E.coli repressor proteins block the production the enzymes needed to break down lactose in the cell. However, when Lactose is present, it will bind to the repressor protein, causing it to fall off, and allowing transcription to occur. As transcription occurs, these enzymes are made and lactose is broken down into glucose and galactose. Since there is small amounts of lactose now in the cell, the repressor binds again to the operator, blocking transcription from taking place. Describe the process of alternative RNA splicing. Outline an example of alternative splicing the results in different protein products. The external environment in which the organism is located or develops, as well as the organism's internal world, which includes such factors as its hormones and metabolism can have an impact on gene expression. Temperature and light are external conditions which can affect gene expression in certain organisms. For example, Himalayan rabbits carry the C gene, which is required for the development of pigments in the fur, skin, and eyes, and whose expression is regulated by temperature (Sturtevant, 1913). During embryonic development embryos contain chemicals called morphogens, which can affect gene expression and thereby affecting the fate of embryonic cells depending on their position within the embryo. A chemical example, was the use of Thalidomide by pregnant woman for morning sickness. It was thought it was harmless for humans but was not thoroughly tested. The drug was withdrawn too late to prevent severe developmental deformities in approximately 8,000 to 12,000 infants, many of whom were born with stunted limb development. Interestingly, despite the fact that thalidomide is dangerous during embryonic development, the drug continues to be used in certain instances yet today. State the effect of DNA methylation on gene expression. Compare methylation patterns in twins using superimposed images of dyed chromosomes. Moshe Szyf is a pioneer in the field of epigenetics, the study of how living things reprogram their genome in response to social factors like stress and lack of food. His research suggests that biochemical signals passed from mothers to offspring tell the child what kind of world they're going to live in, changing the expression of genes. " Explore gene expression with the Amoeba Sisters, including the fascinating Lac Operon found in bacteria! Learn how genes can be turned "on" and "off" and why this is essential for cellular function. ​We learned about gene expression in biochemistry, which is comprised of transcription and translation, and referred to as the "central dogma" of molecular biology. But how is this process regulated? How does a cell know which genes to express and when? Well it's pretty complicated, but let's just get our feet wet by looking at operons, epigenetics, and transcription factors! ​This video “Your DNA, the Environment, and Epigenetics” introduces the concept of epigenetics by demonstrating the outcome of an environmentally induced epigenetic change through animation.